For half the price of Lotus's 1-2-3, Borland International's Quattro delivers more spreadsheet power, flexibility, and ease of use. Quattro has its own unique set of commands for performing basic spreadsheet manipulations. However, the package includes an add-in program called Menu Builder which makes it simple to rewrite or rearrange the menus. These menu definitions may be loaded from disk. The program's 1-2-3 compatibility, therefore, comes from loading a special menu tree. Quattro allows two menu trees-a main and an alternate-to be loaded into memory at once. These menus may be set as defaults which are automatically invoked, so it's not necessary to specify which menu tree you want each time you run the program. Quattro contains everything a 1-2-3 user (or beginner) needs to use a full Release 2-compatible spreadsheet, but provides much more for the user who is willing to investigate and experiment. Quattro also includes several helpful file-handling features, including the file-compression utility SQZ! Plus. Rather than calling the compression routine, you simply supply the correct filename extension and SQZ! compresses the file in the proper format. Of course, Quattro can handle dBASE and Reflex file formats, but even more interesting is its ability to handle Paradox files. Borland is clearly making its move on the dBASE/1-2-3 market, and providing a database and spreadsheet combination as powerful and usable as Paradox and Quattro could make Borland an even bigger force in PC-compatible software. Another of Quattro's commonsense features solves the problem of bringing word processor documents in as spreadsheet data. Many people use word processors to keep simple databases before they even have access to a spreadsheet or database program. Eventually, that simple list of names and numbers can get unruly. When Quattro imports a text file, each line is interpreted as a long label, even though it may, for example, contain a name, address, phone number, and salary. Quattro's FileParse menu provides an easy way to separate the elements of each line into individual cells. Simply create a format line that indicates where breaks should occur and what data types are expected. After you've defined input and output ranges and executed the command, Quattro transfers the text data to the output range in its proper form. One nasty WordPerfect file (which was extremely wide and had been printed to a DOS text file) contained lines which were too long for 1-2-3 to import. Quattro was able to import the file, and the parsing command made it easy to place the individual data elements in the proper fields. Even in an office where 1-2-3 is firmly entrenched, this trick is worth the price of Quattro. 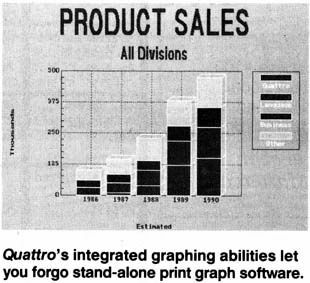 Those who have ping-ponged between 1-2-3 and PrintGraph will instantly appreciate Quattro's integrated graphing facility. Not only is the graphing feature easier to use, but it offers much more control over the look of the final product, even though it still falls short of providing total control and flexibility. Quattro supports numerous printers and plotters, produces crisp graphs on laser printers-including PostScript devices-and will save graphs to disk in Lotus PIC file format or as Encapsulated PostScript. Quattro supports many graphics standards, including Hercules, CGA, EGA, and VGA. Macro jockeys will be glad to lose some of their chains, since with Quattro the 27-macro limit is not in effect. Quattro makes creating macros easier by providing a built-in macro-recording feature that is easy to use and effective. To assist with macro testing and editing, Quattro provides a macro-debugging environment. 1-2-3 macros run in Quattro as long as the proper menu is in use. It is possible, for example, to use the Quattro main menu, then switch to the 123.ALT menu to run 1-2-3 macros, returning when finished. In addition to having the macrorecording feature, you can use the Transcript add-in for regular updating of a log file as you work. If a power failure occurs, most of your work can still be recovered. For most users, installation will be extremely easy. Quattro automatically detects most graphics devices, so installation consists mostly of copying the files to the appropriate disks. Since Quattro is not copy-protected, the process is safe and simple for hard disk users, with no need to worry about uninstalling before performing certain hard disk operations. While the box containing Quattro is flimsy and lightweight, the program's documentation is not. The three manuals are clear and competent. A Getting Started with Quattro manual addresses the separate needs of the beginner; the Reference Guide covers major topics in separate sections, with subtopics arranged alphabetically; and the User's Guide discusses a full range of topics in detail, providing a thorough introduction to every aspect of Quattro. Perhaps the best feature of Quattro is its highly personal feel. Virtually every aspect of the program is customizable to your preferences. In a head-tohead contest, Quattro wins because of its flexibility, power, and ease of use. Of course, 1-2-3 currently has the edge in terms of support products, but Quattro add-ins should arrive on the market before long. Many spreadsheet users will stay with 1-2-3 because of HAL, Write-In, See-More, or other 1-2-3 companion programs. Others will find that even if they have 1-2-3, Quattro offers enough productivity-increasing features to justify having both programs in the spreadsheet toolbox. However, those who have yet to purchase either package and would like to use the 1-2-3 command set should simply look in the mailorder software advertisements under Q.